Marco Rubio’s infamous water break completed its life cycle this weekend, going from ubiquitous .gif to Saturday Night Live sketch, but the senator may get the last laugh. 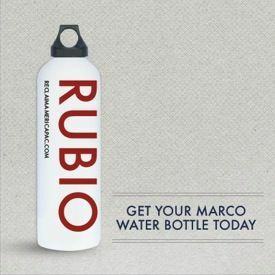 According to ABC News, Reclaim America, Rubio’s PAC has sold more than 3,450 “RUBIO” water bottles in the past week, raising over $100,000. Last week the PAC announced that it would send a bottle to anyone who donated at least $25, saying, “Send the liberal detractors a message that not only does Marco Rubio inspire you … he hydrates you too.” The PAC also has tons of Rubio baseball caps sitting around, so expect the senator’s next gaffe to be headgear related.